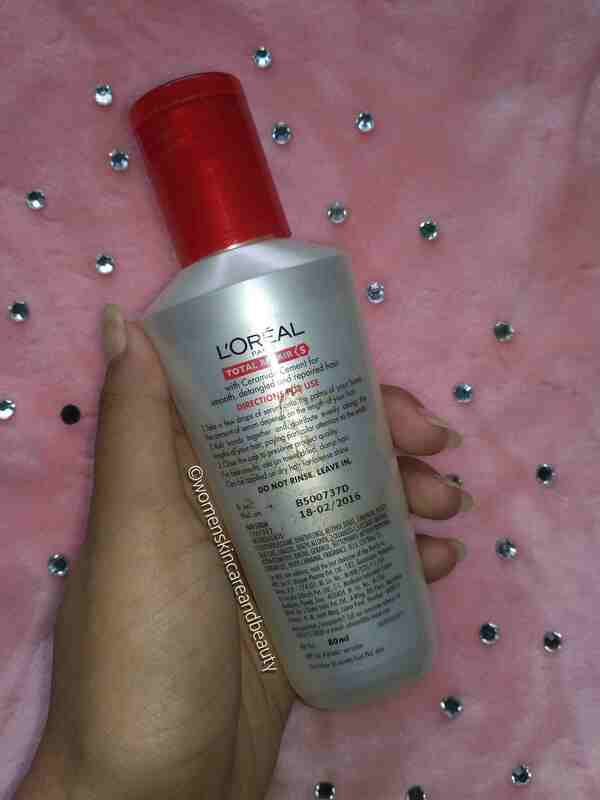 Loreal Paris total repair 5, instant smoothening and nourishing oil serum for unmanageable, damaged hair. Technological innovation – ceramide cement! Daily aggression from sun, water and pollution makes your hair dry, rough and unmanageable. The hair tangles and breaks. Loreal advanced research has created the new total repair 5 nourishing oil serum. 1. When applied, it instantly attaches itself to damaged areas, repairs and unifies the hair’s surface, creating a protective shield against further damage and split ends. 2. Nourishes and smoothens your hair from root to tips; hairs feel silky, looks healthy and is easy to style. 1. Strong 2. Smooth 3. Shiny 4. Detangled 5. Protected tips. 1. Take a few drops of the serum onto the palms of your hand. The amount of serum depends on the length of your hair. 2. Rub hands together and distribute evenly along the lengths of your hair, paying particular attention to the ends. 3. Close the cap to preserve product quality. For best results, use on towel dried, damp hair. Can be applied on dry hair for intense shine. Do not rinse. Leave in. INGREDIENTS: Cyclopentasiloxane, dimethiconol, alcohol denat, limonene benzyl salicylate, linalool, benzyl alcohol, 2-oleamido-1, 3-octadecanediol, alpha-isomethyl ionone, geraniol, butyl phenyl, methyl propional, citronellol, hexyl cinnamal, fragrance. COST: INR 240 for 80ml. The packaging is typically similar to the other products of the range.. All the details are mentioned on the cardboard box that it comes in and also on the body of the bottle.. I have a dry, damaged and frizzy mane.. No matter which conditioner I use, it is hard to control my frizz! I have been using this product for months now, after towel drying my washed hair in the morning and it has helped to keep my frizz under control to a pretty good extent, though not completely, untill the evening.. It also keeps my hair tangle free for about a day after which it starts getting messy again.. Upon applying this serum on dry hair, it does make the hair look shiny and silky as claimed and also keeps them detangled for long..
1. Affordable, travel friendly and easily available both online and offline! Buy it from here! 2. Application on damp hair keeps the hair frizz free and detangled atleast for the day. 3. Makes dry and damaged​ hair look healthy. 4. It does make the hair shiny and silky, when applied on dry hair. 1. Haven’t seen any significant decrease in split ends even after using the Serum for months. 2. Doesn’t make the hair stronger or smoother in the long term. 3. The effects don’t last in rough weather. I’m a housewife. So, i have no problem with my conditioning hair. But whenever i go outside its very hard to manage my frizzy hair. So i wanted a good serum. 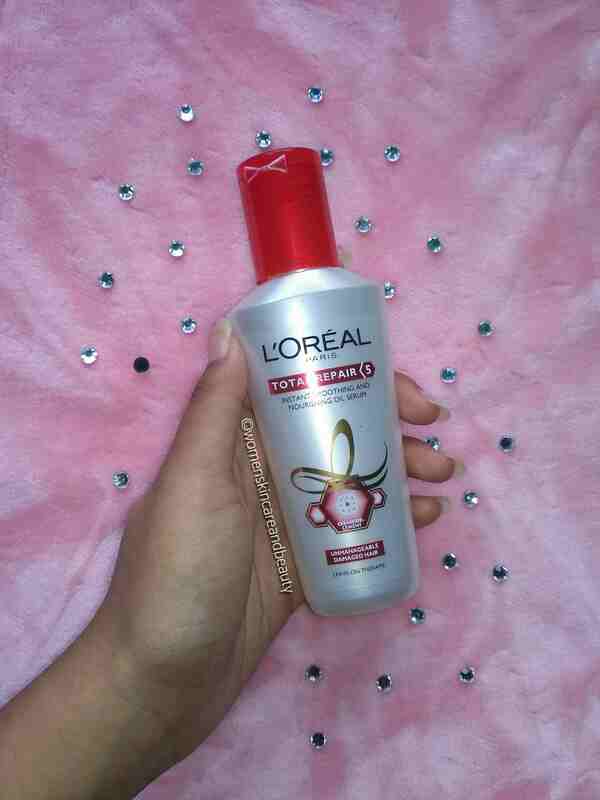 As i uses loreal range of shampoo and conditioners so, i wanted to give a try to loreal range of serums. But from your review it sounds that this particular serum is an average though it is an affordable product. So, i will try another one. I have used this in the pst and i absolutely love the product! This was a damn honest review. I feel the same for this serum. I Haven’t really tried any serums on my fine thin hair. And This sounds like an average product. I have used this and have loved my experience. QUite affordable serum. Yes it’s really affordable compared to other serums! Yes.. it doesn’t work effectively in harsh weather! Thanks for the honest feedback. I have really fine hair so I don’t really use a serum as it ways my hair down. Yes for fine hair, serums will be heavy! Amazing and superb pics of product. I am glad that your blog gave an honest review ! As I have used this product My personal views are same as yours ! Thanks for the honesty ! I have used this hair serum for my dry and frizzy hair. I too found it as an average serum. Nice review. I too belong to the second category and mostly resort to organic options. Based on your review looks like I should consider this product in next purchase. It is a decent serum that works best in fazzy hair. Honest review. This serum looks magical. For the people like me who struggle a lot because of the hair issues. Thanks for sharing . I love hair serums. I have never tried this though. This sounds good. Nice and detailed review , the product seems Okay , what I didn’t liked is it has alcohol .